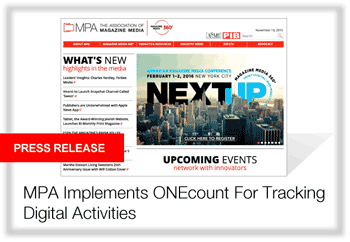 MPA—The Association of Magazine Media has chosen ONEcount to tailor a better user experience. MPA will use ONEcount to identify users against its first-party member database and then track their activities across separate online silos. This will provide better intelligence into how MPA members are consuming content, as well as the ability to target offerings to specific members for an overall better experience. Because of its extensive list of publisher-specific tools and integrations, ONEcount is ideally-suited to help magazine brands leverage their audiences for higher CPMs and greater engagement. The ONEcount toolkit combines behavioral and identity-based analytics and targeting so that magazine brands can offer advertisers a premium audience within their advertising framework.